Fergus Ewing said the bill for salmon processors alone will run to at least £15 million in costs for extra paperwork that will be needed for exports. Issues surrounding export health certificates need to be resolved “immediately”, he said. Highlighting the prospect of a potentially huge financial burden for the sector in a letter to Environment Food and Rural Affairs Secretary Michael Gove, Mr Ewing said: “The practical consequences of a no-deal Brexit become more stark by the day. “Our work on contingency planning has identified that the number of export health certificates required by the salmon industry could quadruple from around 50,000 per annum to 200,000. “This would cost around £15 million extra each year – even if the EU’s more stringent requirements for certificates are disregarded. “Industry will see no benefit from this additional paperwork. “At the same time, imports of similar products to the UK from the EU will not be subject to these requirements, creating an asymmetry that is only to the detriment of our own industry. Official figures show Scottish seafood exports globally were worth nearly £1 billion in 2017, with nearly two-thirds of the total accounted for by salmon. It is estimated that salmon farming alone supports around 8,000 jobs in Scotland, including in factories, while many more people are employed in the wider processing sector. Much of the fresh seafood exported from the north and north-east currently goes into the EU. Last month, Ryan Scatterty, managing director of Thistle Seafoods, based in Boddam, near Peterhead, warned Scottish Affairs Committee MPs a Brexit transition agreement on trade was vital for Scottish seafood processors. He added: “A hard no deal, with us potentially crashing out, will cause major problems”. Mr Scatterty also warned of a looming jobs threat for the sector after the UK quits the European Union. Many of the people currently employed in Scottish processing factories are migrants, whose long-term ability to work in the UK is still in doubt. Yesterday, Scottish Salmon Producers Organisation chief executive Julie Hesketh-Laird said: “We would support any moves to lift the threat of disruption to trade. “However, the farmed salmon sector believes all those involved – from governments to local authorities – should find the resources for long-term solutions. Firms in the wider seafood processing sector were reluctant to speak about the potential impacts of Brexit. 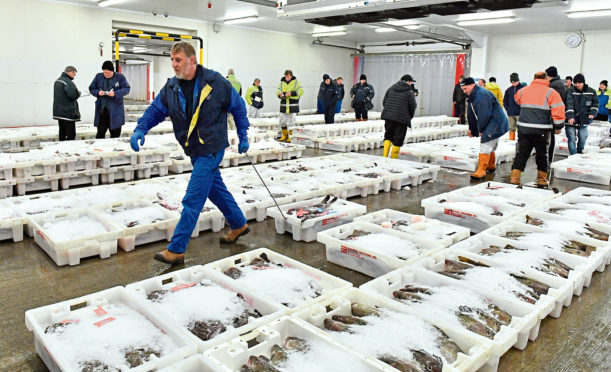 A Defra spokesman said: “The UK Government remains committed to securing the best trade deal for the whole of the UK’s fishing industry when we leave the EU and become an independent coastal state. Mr Gove recently announced £37.2 million of extra funding to boost the UK fishing industry.